This is a two-way correspondence. Write back and tell me what's up with you! On May 12th my son and his family arrive in Austin from Harare, Zimbabwe to spend a week at my daughter's house. They may have thought they'd get a little quality time with Amy and Mike away from the grandparents .... but they should have known better. I fly down today (the 11th) and Grandpa Ron arrives on the 13th. After a week together in TX Monique will take the family to Pasadena to hang out with her folks until June 1st, when they all come to Pittsburgh to spend two weeks with me. YAY!! And in the middle of their stay Monique goes to DC for training and Dan's going to TN for a wedding and I get to watch Sebastian for 48 hours. Hooray! I'm very excited about that. International Sing Out for Earth Day! My friend Hali Hammer thought it would be great if everyone in the world would sing Woody Guthrie's iconic "This Land is Your Land" at the same time on Earth Day - April 22nd. Thousands of folks responded. At Noon Pacific Daylight Time groups gathered in Dallas, Pittsburgh, San Francisco, New York, Vermont, Atlanta, Costa Rica, Florence, OR, Detroit, Ft Lauderdale, FL, Lancaster, PA, Sarasota, FL, Minneapolis and many other cities. The big edited version of all the performances is happening in CA right now. I'll be sure to post a link when it's finished. "Thou shalt not mess with women's reproductive rights"
Of course we sang "The Internationale," and many many others. Thank you so much for any help you can give to these workers! A very touching moment of the weekend was when Jerry Tucker's daughter Tracy accepted the "Troublemakers' Award" on behalf of her most wonderful father. I've decided to do a tour in July to see how well I hold up. I feel terrific right now, and I'm so looking forward to getting on the road and singing again. I'll be working my way from Santa Cruz, CA to Portland, OR and back, and I still have a few dates open that I'd like to fill. I'm calling it the "Hard-Travelin' Tour" in honor of Woody Guthrie. I'm celebrating his hundredth birthday this year by touring with Mark Ross and Adam Moss with a show of songs Woody wrote, or could have written.... Mark is an amazing multi-instrumentalist... banjo and guitar and many more. When he was a kid he read Woody Guthrie's "BOUND FOR GLORY" and thought it was an instruction manual. He's been on the road for over 40 years now. Also joining us starting July 6th is Adam Moss, fiddler extraordinaire. A founding member of the fabulous Green Mountain Grass, Adam (also known as 'Pickles') is in constant demand for his prodigious skills on violin and dynamic stage presence. I hope you'll check the open dates to see if you can help with a show, and clear you calendar and tell your friends - Anne Feeney's back on the road with a honkin' wonderful show!! Price: $15-25 suggested donationBarbara and TD Daniell are the contacts. Email td6669@gmail.com for reservations and directions. Seating is limited! It's My Birthday!! Any ideas?? I'd love to sing at a UU church, do an evening concert somewhere ... any ideas? Ashland , ORWes Brain is the contact. 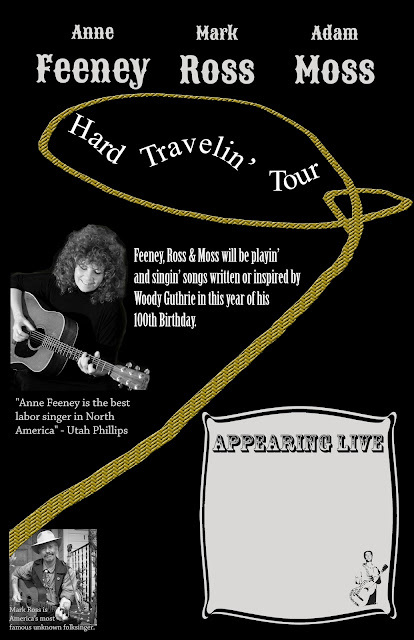 Happy 100th Birthday Woody Guthrie - Featuring Feeney, Ross and Moss - The Hard Travelin' Tour - with Raina Rose!! Eugene, ORJim Evangelista is the contact. http://oregoncountryfair.org/Feeney, Moss and Ross busking the 8 with a "happy 100th birthday woody guthrie!" show.